This is the second album from Lila Rose. Her first album, "Heart machine" was mainly electronic but for this album, while she's kept plenty of electronic elements such as the synths she's using far more real physical instruments. The album is about a big passion of hers - the environment, but it's not the corny "save the rainforest" sort of song you might expect with that subject, instead there's more depth and the results are excellent with emotions such as anger and sadness clear at times. Fans of her previous album needn't worry - despite the use of more physical instruments, the sound is still predominantly electronic. So what can you expect? In short, great vocals backed by electronic sounds that give a quite unusual sound - it's not the sort of typical electro-pop sound that the instruments could produce, there are more natural sounding rhythms, eerie sounds and it can feel quite dark in places. There are parts where the electronics are replaced by real instruments - the string opening for the final track, "We animals" is a good example. The first song to be released from the album is "World on fire". It gives a very good idea of what to expect from the whole album - have a listen using the player at the end of this review. It's a great album. Electronic music isnt normally my thing but this is so well done and has a sound that stands out from the crowd, that I really enjoyed listening to it. Definitely well worth a listen. 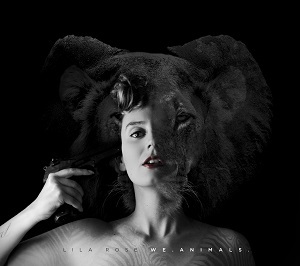 Special mention goes to the album artwork - you need to check out the full size version on her Facebook page to see just how beautiful it is with its combination of her holding a gun to her head with overlaid almost ghostly animal heads.